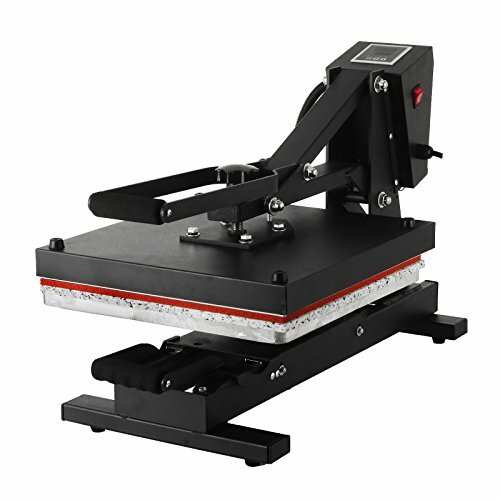 15" x 15" clamshell heat press t-shirt digital transfer sublimation machine this 15x15inch heat press is ideal for a whole range of items from t-shirts to jigsaws, mouse mats, lighters, coasters, and many more. It's suitable for heat pressing fabrics, ceramics, metals, or other materials designed for heat transfer. The pressure can also be adjusted to cater to a wide variety of materials, so your production and personalize requirements are met. Features: 1. Draw clamshell configuration - draw or "pull-out" style clamshell design 2. Fully digital temperature and time control, lcd displays show the temperature and time 3. The special thickened heating plate effectively guarantee the even and stable temperature 4. Integrated electric control system for simply adjusting and maintenance 5. Heating surface-coated with high temperature resistant anti-sticking layer for convenient cleaning technical parameters: Machine color: Black power input: 110v wattage: True 1,420 watts rated printing area:15* 15inch (38x38cm) upgraded lower platen - 1/2" thick aluminum board 22" long arm handle with ergonomic foam-grip temperature range: 0℃-399℃(up to 750f) timer control: Adjustable from 0-999 seconds package included: 1. 1pc fully-assembled flat heat transfer machine 2. Removable and reversible hi-temp silicone pad, and the lower platen or "press bed" slides out to allow more convenient access to your working material. This heat press machine uses advanced spring air with high temperatures and pressures, to make an exact transfer on t-shirts, pants cloth, etc. If you have any questions about this product by VEVOR, contact us by completing and submitting the form below. If you are looking for a specif part number, please include it with your message.